Established in 2010, MEDPATH provides in-house Physician Recruitment and HR services for healthcare organizations of all shapes and sizes. Our leadership team has a combined 40+ years of staffing and HR experience. 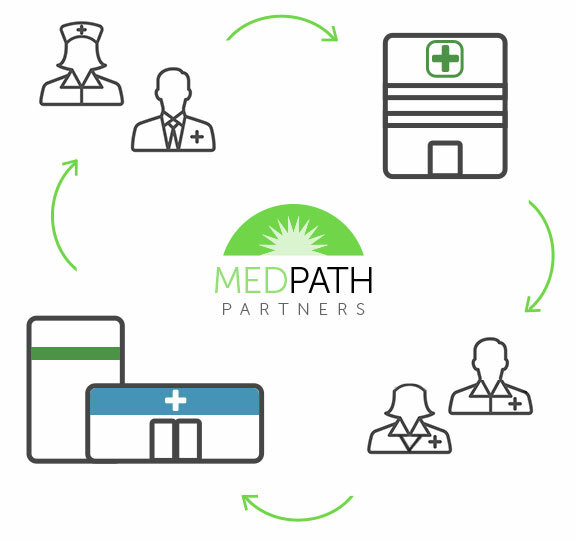 While partnering with MEDPATH we expertly design and execute a customized Physician acquisition process that delivers inspiring results. Working together collaboratively and seamlessly, we’ll help transform your organization’s approach to talent acquisition and talent management. Our creative methodology enables your organization to operate efficiently, capture growth opportunities, and maximize revenue. Core Competencies include Physicians, Physician Assistants, Nurse Practitioners, CRNAs and other advanced healthcare professionals. We act as an extension of your organization and operate under your brand – we are your brand ambassador! Lower reimbursements, healthcare reform, accountable care… Lets face it… The business of healthcare has changed – but the business of Physician talent acquisition has not. We are a one-stop-shop solution for all your Physician recruitment initiatives. Our creative suite of staffing services provides superior results while lowering your overall cost of recruitment. Metrics driven: We’re all about speed, cost, and quality! Our services can be utilized selectively or in concert. Whether you’re a hospital system or medical practice, new venture or established organization, our highly effective Physician staffing solutions will give your organization a competitive edge! PROS provides in-house Physician recruitment services for healthcare organizations that do not employ their own Physician recruiting department – OR – work as an extension of an existing department when extra HORSEPOWER is needed! Our recruiter works onsite at your facility (or in a virtual location if necessary). Behind your dedicated recruiter is a team of recruiting specialists that provide additional recruitment support for the hard to fill positions (at no additional cost)! Our services can be utilized as a temporary measure or as a long term strategy – which we’ll always aim for! We provide full recruitment services from candidate sourcing & screening, site visit management, contract negotiation, relocation coordination, job fair representation, and more. We also build your local float pools to cover your occasional gaps in coverage. While we aim to minimize your dependency on outside search firms we select and manage third party agencies for selective positions on an as-needed basis. We review and negotiate terms of their agreements and strictly manage the vendor relationship to protect you from any unnecessary fees. We are dedicated to developing brands that are inspiring ! We offer full-service brand, digital and communications services staffed with experienced marketing professionals. We help architect your employer brand that will help set you apart from your competition! Medical FlexStaff Partners (MFP) is an innovative staffing solution designed to provide healthcare organizations with their own internal Locum Tenens service. Our plug & play model streamline’s the recruitment process of temporary Physicians and advanced healthcare providers while driving down contract labor costs. By using a whole lot of ELBOW GREASE, MFP efficiently connects hiring managers with float pools of candidates who are qualified, interested, and credentialed for their temporary assignments. Absolutely no “candidate buy-out fees” associated with our service -you are free to hire your temporary staff on a full-time basis with no additional cost! Our innovative workforce solution provides healthcare organizations with hiring flexibility and a significant cost savings each year. Additionally, by filling positions with temporary staff, your organization will capture revenue which could otherwise be lost with an open position! Our seasoned HR professionals offer your organization with ongoing or as-needed support using a flexible support model. Our services cover the full spectrum of the Human Resources administrative function, covering the employee life cycle and all organizational functions. Our services are conveniently delivered on a monthly retainer or on an hourly basis. MEDPATH provides opportunities for Physicians and other advanced clinicians with leading healthcare organizations. Full-time, part-time, and moonlighting opportunities available. Whether you’re in a transitional phase or passively exploring new opportunities, feel free to browse our openings and apply for a position you’re interested in. If you don’t find what you’re looking for, please consider submitting your CV for future considerations.